My Masterpiece – a creative, wholehearted and transformative multi-arts Movement led by husband-and-wife teaching-artists Rayyn and Anna Cortez, with Anna’s sister Kara Escay – sparks hearts, shifts views, stretches ways of being and creates breathing space – through creativity and the multi-arts. Together let’s spark a culture of creativity! We’re here to inspire and enable you to shine and be the extraordinary masterpiece you already are! 1. MY MASTERPIECE CELEBRATIONS: Imagine and Play with us! 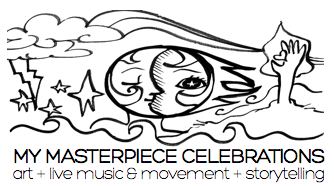 My Masterpiece Celebration packages include transformative art, live music, and amazing storytelling. Planning a party or celebration? Organizing a school, group, org, brand or corporate event? Book us and Celebrate the “My Masterpiece” way! 2. MY MASTERPIECE WORKSHOPS: Create yourself and your world! Re-charge your spark. My Masterpiece Workshops include heart-sparking frameworks, view-shifting conversations and imagination-stretching multi-arts activities. Partner with us! We design and coach-facilitate welbeing, communication and leadership workshops for schools (students grade 5 up + teachers, administrators, parents), communities, companies, families and organizations. 3. MY MASTERPIECE MULTIMEDIA: Share your story with us! We are MultiMedia Storytellers for brands, groups (schools, companies, organizations), and events (weddings, anniversaries, birthdays). Awaken your senses. See your story come alive through writing, illustration, photography, video, original music, and amazing animation. 4. MY MASTERPIECE ART-WEAR: Wear your spark! Life is a D:IY (Dare: Inspire Yourself) Project. We’re all splots of possibility. We have the power to be anything and everything we choose to be. We create ourselves everyday. Through our concept art-wear, we share spark words that inspire us to celebrate and be the masterpiece that we already are. 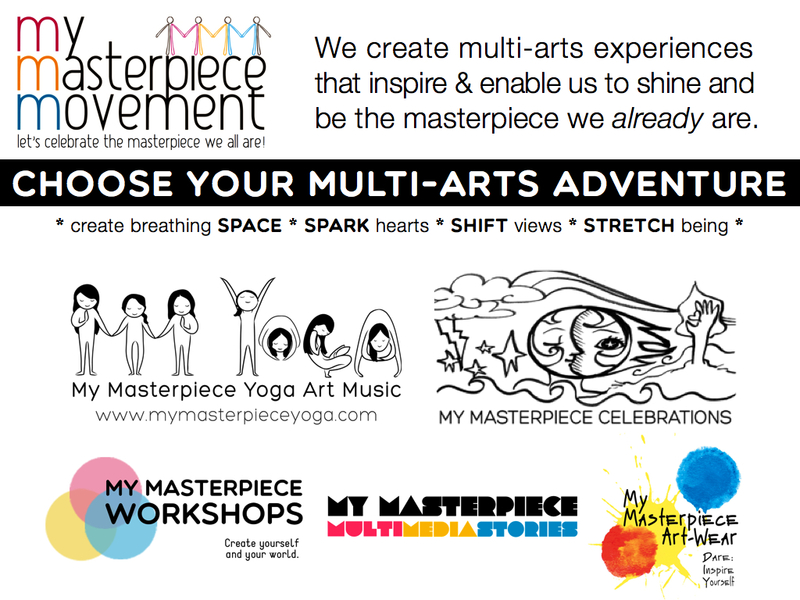 Experience yoga, art and music the “My Masterpiece” way. This innovative home-grown program teaches yoga sequences and breathwork through wonderful interactive movement stories/poetry and draw & tells written by Anna, original alternative music performed live by Rayyn, and transformative art and how to see & draw facilitated by Kara. Support the movement. Be a spark. Let’s celebrate the masterpiece we all are! Collaborate and partner with us today.